The Everglades is a magical place. From the gorgeous vistas of unending sawgrass to the peaceful air that’s free of the constant sounds we hear every day, it’s hard not to love every inch of this place. Unfortunately, we have very limited access to exploring the Everglades on foot as it is mainly wetlands. We here at Fort Lauderdale Airboat Rides have you covered. On one of our Everglades tours, you’ll be able to experience an adventure unlike anything else. 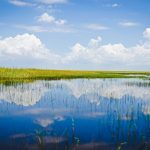 While we can never guarantee that you’ll see a particular animal or sight as the Everglades are untamed and free, we can tell you about some of the things you should expect while cruising on an Everglades tour. The Everglades is known to be home to some of the most exotic animals in the world. Hundreds of birds species flock to the Everglades and fly overhead, while the famous American Alligator sunbathes on the sandbanks. The Florida panther also resides in the Everglades, however, they tend to stick to the dry land areas of the area. While on your Fort Lauderdale Airboat Rides Everglades tour, you’ll have the opportunity to spot these animals living in their own ecosystem. As previously mentioned, you have a very good chance to see animals such as the American alligator, but there is no guarantee. We typically have very good luck with spotting a wide range of animals, however, there may very well be days where they choose to hide away. Our expert captains will do their absolute best to help you spot animals as we pass by and provide any information you’d like to learn about them. Thankfully the Everglades is located in South Florida, so the weather is usually incredible. A cool breeze blows by as our airboat gently flies through the endless rows of sawgrass. There’s never a bad time to go on one of our Everglades tours, as the weather is fantastic year round. In the winter temperatures typically don’t drop any farther than 60 degrees. We would highly recommend bringing a windbreaker or light jacket as the wind can make it colder than it actually is. During the Spring, Summer, and Fall, you’ll find that the climate is excellent, especially as the sun begins to set. 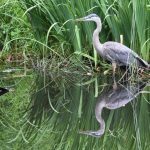 While on your Everglades tour you’ll find that there’s not one bad spot for a photo opportunity. Everywhere you look you’ll see remarkable views where the sky joins the water. Mangrove forests line the waterways. As the sun begins to set, you’ll discover a sight, unlike anything you’ve ever experienced. The sky turns orange and the water we pass over reflects it. The air is peaceful and the water is calm. 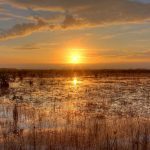 You’ll find the true beauty of the Everglades is the fact that it’s still relatively untouched by humans, and as a result, it ends up being one of the few places on Earth that is still natural. If you’re looking for the best Everglades tours, then you need to ride with Fort Lauderdale Airboat Rides. Contact us today to schedule your airboat ride today with us by calling (954) 284-9130.